"The Scientist" is listed in the Guinness Book of World Records as "Most Charming Song." It's a fact. Look it up. 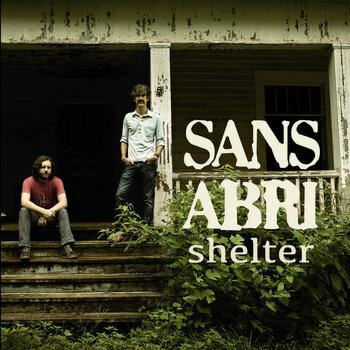 Sans Abri is a side project of Josh Erwin and Michael Paynter, who bluegrass fans might know as the founding members of the Packway Handle Band. But Shelter is a pretty far cry form traditional folk. Sure there are mandolins and guitars and banjos and things. "The Scientist," starts up as '90s-throwback, Soul Coughing-like acoustic ditty that gradually builds in complexity and beauty. Shelter is a truly outstanding album that is much deeper than at first glance. Erwin and Paynter's voices entertwine, bounce off each other and harmonize, as do their instruments. It's really something to hear the way they work together to create something lyrical, entertaining, and yes, beautiful. It's already one of my favorite albums this year.